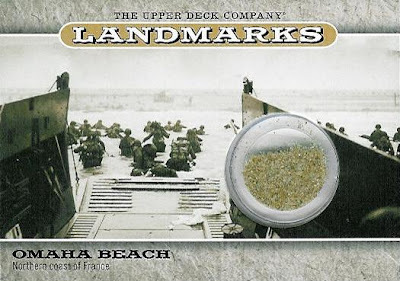 A few weeks ago I posted about really wanting to get my hands on a copy of the Goodwin Champions Landmarks Omaha Beach card. However, at the time the redemptions were being sent out by Upper Deck and making their way to eFee (eBay), they were trading for between $65-$70, which was considerably more than I was willing to pay. Well, thanks to Saved Item Alerts and being kept abreast of the latest ones to be listed, my patience finally paid off and I got this one in the mail today for $41. As someone who has always been interested in WWII history, coupled with a deep appreciation for the military this card now holds a special place in my collection. This picture is very famous and I became curious about the photographer. His name was Robert F. Sargent and was a Chief Photgraphers Mate in the US Coast Guard. He landed with Company E of the 16th Infantry, 1st Infantry Division (Big Red One). Great card! Looks like you got a nice deal on it too. That is one of the few "NON" sports cards cards I really want. That's the best non-sports card I've seen in a long time. Well done. I love World War II history as well and this card is one of the coolest things I have ever seen.